Combining a tunable laser with an on-chip amplifier has enabled a versatile and powerful tool for spectroscopy and other applications. 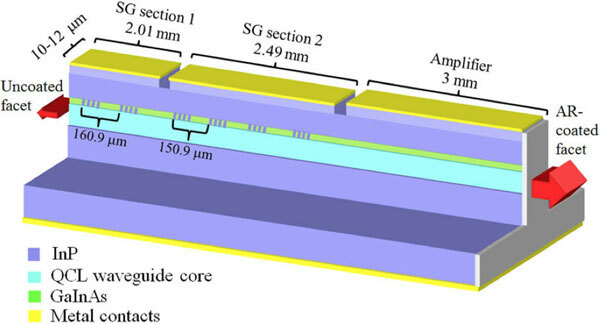 A team from Northwestern University demonstrated a single-mode quantum cascade laser (QCL) emitting at a wavelength near 4.8 μm by integrating an asymmetric sampled grating distributed feedback tunable laser with an optical amplifier. With this architecture, the laser demonstrated output power an order of magnitude greater than its predecessors, and the tuning range was enhanced by more than a factor of two. Schematic of a single-chip laser system developed in the lab of professor Manijeh Razeghi. Courtesy of the McCormick School of Engineering, Northwestern University. In pulsed mode, the system demonstrated >5 W output over a 270-nm spectral range. The researchers reported that refinement of the geometry led to continuous operation with a single-mode spectral coverage of 300 nm and a maximum continuous power of 1.25 W. The output beam was shown to be nearly diffraction-limited, even at high amplifier current. The work was led by and builds upon the research of professor Manijeh Razeghi, who in 2012 developed a widely tunable single-chip mid-infrared (MIR) laser. One important application of the laser system is for MIR spectroscopy for identification of chemicals. Because Razeghi's system is highly directional, the high power can be used more efficiently, allowing for the greater ability to detect chemicals. It also allows for standoff application, which keeps personnel physically distant from potentially dangerous environments. The technology could also benefit free-space optical communications and aircraft protection. Funding came from the U.S. Department of Homeland Security Science and Technology Directorate, National Science Foundation, Naval Air Systems Command and NASA. The research was published in Applied Physics Letters (doi: 10.1063/1.4938005). I agree with bobhope1 in terms of the overall need to have much larger powers. I was part of a chembio demo a few years back and we were struggling with 500 meter detection with 100 microjoules/pulse. For accurate standoff detection I think that 100 mJ/pulse at 3-5 km would be about correct. You could debate if it needed to be as high as 300 mJ/pulse. I suppose it would depend on your collection optics and sensor technologies. Interesting. QCL technology certainly has applications, but I would question its viability in the case of real standoff detection - say 5kms or more. By standoff, I mean tactically mobile, freestanding unit, independent of beam paths defined by pre located retro-reflectors. The latter, if a US gov solicitation put out a couple of years back is to be considered a guideline, requires pulsed energy in the 300mJ, ~100ns FWHM ( or less ), approaching ~1kHz in burst sequences. In this latter case tunable over at least ~2.5um. Thus one would require say 600,000 of these units in an array, coherently beam combined, all commonly tuned, to get to that pulsed power level, and only for tuning over ~ 270nm. One would also need ~10 similar arrays in a common unit to get/attain the ~2.5um tuning range specified. Even conceiving of such seems to me to be the very definition of self deception. I would also question the validity of the whole concept of 'standoff' at 10s to perhaps 100meters. It seems to me, more often than not under such 'standoff' conditions there would be a very real risk of personnel/equipment exposure - thereby winning you nothing significant operationally. Finally, the objective of standoff is to give timely warning to allow pre-emptive action. Move resources, or population, gear up hospitals and so on. +5km warning has meaning in that sense for a plume moving with prevailing air flow, it has zero meaning for a 'standoff' of <100ms. 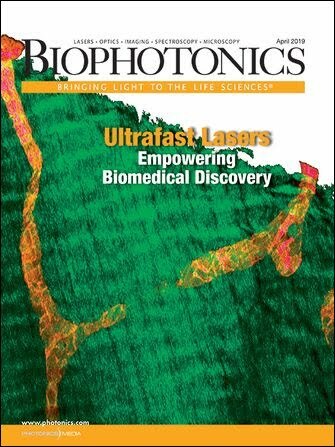 Photonics Media reached out to professor Razeghi and got this response. She stressed that the views expressed are solely her own and do not in any way represent the views of any entity of the U.S. government: To clarify the terminology used, standoff detection is not defined solely by range. The most basic definition is simply non-contact, real-time detection. While it is certainly advantageous to have longer range in many cases, there are a number of applications that operate within a 1-100 m range. Improvised explosive detection or chemical residue analysis are both extremely important examples which will benefit tremendously from a rugged and lightweight tunable source. There have been multiple solicitations for this technology (look it up!) The other possibility is site monitoring, such as on a factory floor or well site. A single tunable laser could monitor the entire site for a contaminant with continual raster scans. In the mid-infrared, this technique can be extremely quick as well as eye-safe (see ANSI standards). This type of technique is currently being used for methane detection. These types of applications also benefit from wafer-scale manufacturing, which allows for mass production of semiconductor laser in or to realize low cost. The source that is being discussed here is a Watt-class continuous wave source in a single chip (compact) format. This is plenty of power for the application mentioned. Much lower power lasers are already in use. This is also a very different form factor than the bulky 30 mJ/ 100 ns lasers that are mentioned in the comment. Try carrying one of those around with you! They are also not mass producible. The continuous nature of the QCL device also allows access to more sensitive detection techniques, such as the various forms of modulation spectroscopy. The last valid point brought up is the tuning range of the source. It is true that the specific source mentioned has less than 300 nm tuning. Wider tuning gives the possibility for multi-component analysis. However, the featured device is a new architecture and a valid proof of concept for detection of a specific substance, and infrared QCL technology can be adapted to any wavelength range from roughly 3-20 microns at room temperature. In parallel, broadband QCLs are also under development. The same group at Northwestern has developed heterogeneous QCL technology capable of accessing the entire 5.9-10.9 micron wavelength range on a single chip. (see Optics Express vol. 23, 21159(2015)) Even wider ranges are now under development. Imagine the possibilities! I would simply make the following observations in response: a) The author cites standoff applications in the 1 to 100m range. Yes certainly such exist, for example detection of residual pesticides on agricultural produce, factory floor monitoring for release of TIC's, breathalyzer for detection of human exhalations associated with say cancer and so on. Explosive detection at 1 to 100m? No thanks, if you are within 1 to 100m of it and it is a reasonable charge with shrapnel, and it detonates, you may as well just have touched it. So meaningless. Also there is the question of CONOPS. If you are processing a crowd, what do you do? Process them one by one with an inter individual spacing of 100m per person. Such crowd processing is not practical. b) Agreed, MIR there is no eye safe issue per se as there is no retinal transit, and the MPE of the eye is rather high. c) Cost/wafer scale manufacturing? I just looked up QCLs on Thor Labs site. 9um they weigh in at many 10,000's of $ per Watt. That is just the diode, excluding PSU and external cavity say should one be required. By contrast a DPSS hybrid, capable of tuning near throughout the 10um atmospheric window, and producing burst sequences of 300mJ per 100ns FWHM pulse, would weigh in at <1000$/W. So I would question the whole idea of it being so cost effective. This latter particularly if you lump in the number of units you would require to command the volume of space the DPSS hybrid could command. Additionally, the DPSS hybrid can be protected from contamination, after all it would sense a threat with ample time for relocation. With these QCL units, if you can even sense at 100m, then a threat plume moving towards you at 5mph would give you ~ 45seconds to react. That is about enough time to grab your atropine, and perhaps start running, but nothing else. You would abandon all your equipment. d) Agreed, there is a distinction between the form factor for a QCL and a DPSS hybrid of the capability mentioned. But there is a very substantial difference between those capabilities. Nonetheless, a DPSS hybrid of the characteristics mentioned would be man portable, involving a backpack and a rifle sized laser element. So also not a problem. Having as a lad been in a foreign military, and having run around with full kit and rifle ( sometimes more ), I would not hesitate to carry a standoff detection system which would give me better than 1/2 an hour warning on an incoming threat plume at say 5mph. Tactically, one can relocate, protect equipment and so on. A huge plus. e) They are not mass producible. Well, unless your QCL is a stand alone chip, without external cavity and PSU, then they are also not mass producible. f) Yes, using CW permits certain applications - yet it is also restrictive. A pulsed high power system for standoff at significant range permits use of an optical switch prior to return signal sensor. Basically gating optically sensor open only for a limited time at a desired time. That yields range gating plus minimizes background interference/contribution. More or less the only significant noise of concern is intrinsic sensor noise. g) The author mentions 5.9 to 10.9um, and 3 to 20um. In real standoff, the 5.9um to ~8.2um is completely irrelevant. Only output within atmospheric windows is significant. Similarly ~4.2um to 4.7um is worthless. The very fact that these atmospheric absorption band wavelengths are mentioned is an exclusionary to true standoff detection. Please note, I am not decrying QCL's as a technology. I am questioning the whole CONOPS whereby 1 to 100m is considered 'standoff' of any use in the event of hostile action. That in turn brings into question the kind of technology that is being leveraged then to achieve a goal which does not seem very useful in the specific threat case I was discussing. Seems to me the argument of use for civil ( or military )defense and so on does not really hold up to examination as a motivation for the effort. Other motivations do exist as pointed out. Sure, standoff is strictly any non-contact range, but, within the application space, the term referred to >250m. Understood, there is no official definition, but history shows this to be what was meant - and proximate covered the range <250m. This reclassification/general understanding change, is indicative of an industry redefining terms to lower the bar. Industry starts with bold goals, in this case, development of lasers for standoff (i.e. true standoff >250m and out to kilometers/miles). After much money has been spent without success, the money flow is still required, so the bar is lowered, in this case, standoff become a closer and closer distance, to the point that QCLs can actually meet the requirement. Like BobHope1, QCLs per se are not my issue, rather the surreptitious redirection that results in funds for the real, worthwhile goal of real standoff out to miles being directed towards the reduced capability of less than 100m.